Whether you are working in an organization or studying in an educational institution, you need to follow the regulations laid down by the management. One of the most important of these is to submit a leave application when planning to take a leave. Most organizations make use of leave application forms for the purpose. The Application Forms comprises of the important segments which make it easier for the applicant to list down his details and the leave requisition in an orderly manner. 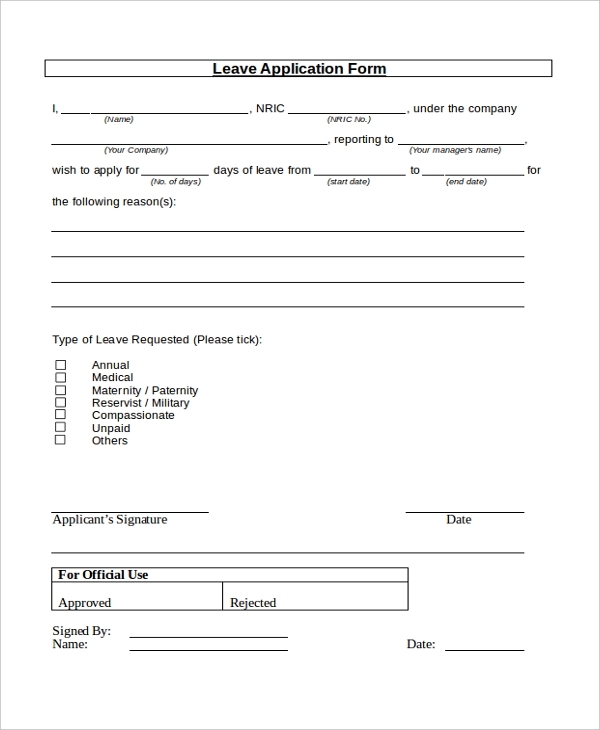 As the name indicates this is a sample of a leave application which can be used by any organization. This form gives the user an idea of the format to follow and the segments that should be included in such an application. The user can further customize this form as per his needs. When an employee wishes to apply for a maternity leave with her firm, she is asked to fill in the aforesaid form with the relevant details. She should fill in her employee details, the date from which he wishes to go on leave and the time period of leave. you may also see Sample General Application Forms. This form gives the user an idea of the format to follow when designing a staff leave application form for his or her organization. This format is a globally acceptable one and comprises of all the essential segments. The user can, however, make changes to this as per his requirements. 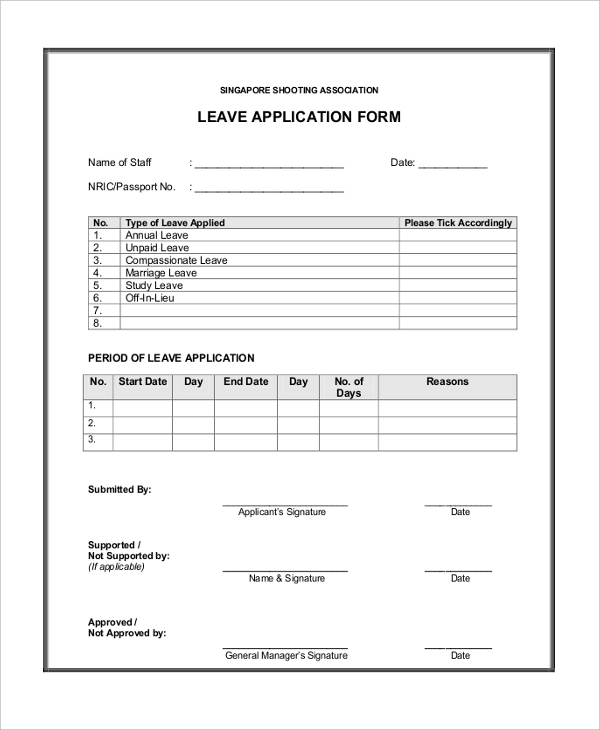 The organizations that offer annual leave to their employees use this form to allow them to apply for leave. In this form, the employee is required to fill in his or her employee details and the period during which the leave is being expected. You can also see Sample Grant Application Forms. 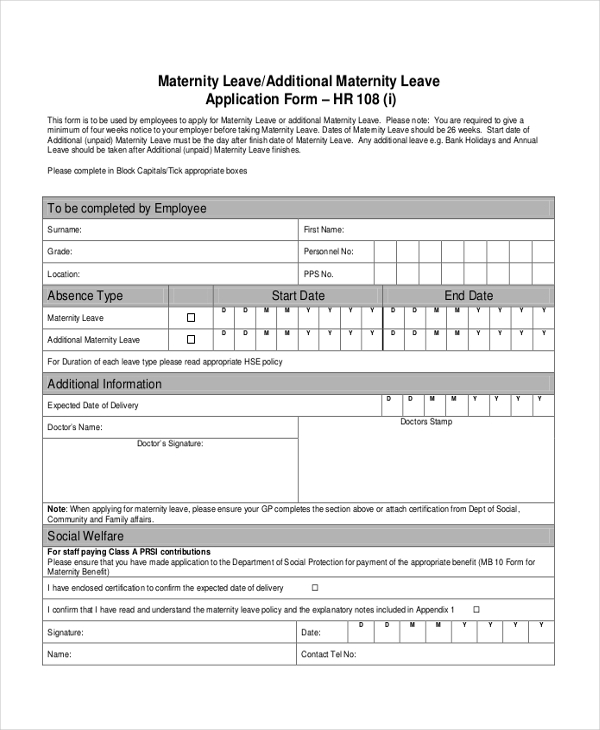 This form is used by the organizations that offer paid parental leave to their employees. This can be used to apply for maternity as well as paternity leave. The employee is required to fill in his details and the time period during which he wishes to avail the leave. 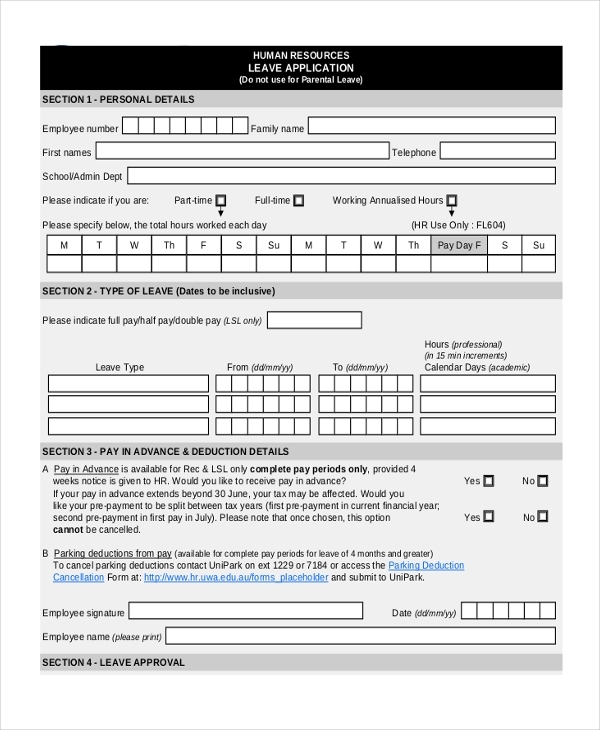 This form can be used by companies and organizations to design a unique leave application form that can then be used by their employees to apply for leave. With all the crucial segments in place, the user can quickly personalize the form. 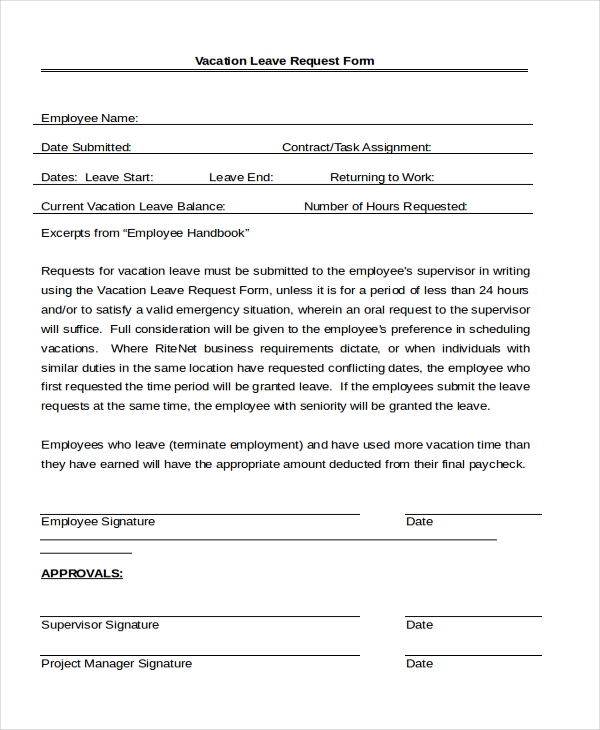 Companies that offer vacations as a bonus to their employees make use of this form to allow their employees to make a request for the leave. In this form, the employee should share the details of the extra hours of work he may have put in to become eligible for the vacation. You may also see Sample Job Application Forms. 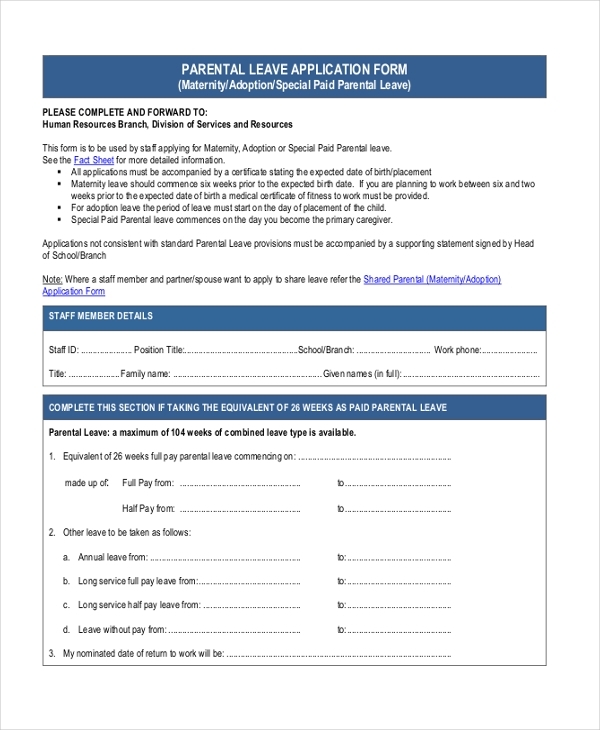 What are The Benefits of Using Leave Application Forms? Designed by experts, these forms adhere to the latest industry trends and follow a globally acceptable format. Not sure how to design a leave application form? Go ahead and check out our collection of these forms. With a wide range to choose from, you are sure to find the one that is perfect for your needs. Download this and make changes to it such that it becomes apt for your organization. You may also see Sample Rental Application Forms.